In Europe, common ash (Fraxinus excelsior) is being decimated because of the invasive fungus Hymenoscyphus fraxineus. In its native range in Asia this ascomycete is considered a harmless leaf associate of F. mandshurica and F. chinensis subsp. rhynchophylla. Field observations from Europe suggest that there is species-specific variation in disease susceptibility among European and North American Fraxinus species, but a wider comparison at the genus level has been missing so far. We assessed disease symptoms and pathogen apothecium development in 17 Fraxinus species from Asia, Europe and North America exposed to high infection pressure in a Danish arboretum. We also tested their susceptibility to pathogen infection through controlled stem and leaf inoculations and subsequently assessed the level of pathogen DNA by a qPCR assay. The results suggested the presence of a phylogenetic signal in disease susceptibility where closely related Asian, European and North American species in section Fraxinus had relatively high levels of H. fraxineus DNA in the leaves and supported high production of apothecia. Leaves from some North American species also contained relatively high levels of H. fraxineus DNA, supported moderate production of apothecia and developed lesions—stating the need to avoid introduction of H. fraxineus to North America. The online version of this article (doi: 10.1007/s10342-016-1009-0) contains supplementary material, which is available to authorized users. Species continuously evolve in co-existence with sympatric species, with competition, parasitism, and symbiotic interrelations being strong drivers for evolution (Gilbert and Webb 2007; Sieber 2007; Thrall et al. 2007). The continuous co-adaptation of species forms the basis for survival and maintenance of fitness of sympatric species according to the Red Queen hypothesis (Liow et al. 2011). Comparison of genealogical trees of angiosperm and gymnosperm host species and their ascomycetous endophytes suggests a long history of co-evolution (Sieber 2007). However, increased globalization and human trade have created an unprecedented movement of species across continents. Introductions of new species may lead to interactions between associated previously allopatric species and thereby significantly disturb native ecosystems. Fungi with harmless endophytic or symbiotic relationships with their co-evolved hosts may behave as severe pathogens in contact with evolutionary naïve hosts in introduced areas (Boyd et al. 2013; Brasier 2008; Lovett et al. 2006; Roy et al. 2014; Santini et al. 2013; Stukenbrock and McDonald 2008). Examples of pandemics caused by introduced fungi on keystone forest tree species include Chestnut blight (Elliott and Swank 2008) and Dutch elm disease (Brasier 2000). The ascomycete Hymenoscyphus fraxineus (T. Kowalski) Baral, Queloz, Hosoya is currently threatening the widely distributed native European ash species Fraxinus excelsior L. at a continental scale. In Europe the disease was first reported in Poland in the early 1990s and Eastern Poland and/or the South Baltic has been suggested as epicenter for the disease (Drenkhan et al. 2014; McKinney et al. 2014). Current evidence indicates that H. fraxineus originates from Asia, where it is associated with local Fraxinus species, Fraxinus mandshurica and F. chinensis (Cleary et al. 2016; Gross et al. 2014a; Zhao et al. 2013; Zheng and Zhuang 2014). Observations from a botanical garden in Estonia (Drenkhan and Hanso 2010) and from forest conditions in Japan (Zhao et al. 2013) and far East Russia suggest that F. mandshurica has lower susceptibility to shoot infection by H. fraxineus than F. excelsior, although lesions may develop after direct stem inoculation [on F. mandshurica var. japonica (Gross and Holdenrieder 2015)]. The European epidemic caused by H. fraxineus has had severe effects. With a history of around 20 years in Europe, common ash is now heavily affected by ash dieback throughout most of its natural range (McKinney et al. 2014). Being a keystone species in European riparian forests, heavy losses of F. excelsior will have substantial effects on associated species (Jönsson and Thor 2012; Littlewood et al. 2015; Lõhmus and Runnel 2014; Lygis et al. 2014; Mitchell et al. 2014; Pautasso et al. 2013). North America is one of the two main centers of diversity of genus Fraxinus with 22 out of the 48 recognized Fraxinus species (Wallander 2012). Fraxinus species are among the most widely distributed trees in forests of Eastern North America (Gandhi and Herms 2010), where they form a significant component of many different forest types, and serve as food and habitat for numerous birds, mammals and many arthropod species (Gandhi and Herms 2010). Six of the North American ash species are commercially important: white ash, F. americana; pumpkin ash, F. profunda; blue ash, F. quadrangulata; black ash, F. nigra; green ash, F. pennsylvanica and Oregon ash, F. latifolia (Stewart and Krajicek 1973). The ash dieback pathogen has not yet been recorded in North America, and knowledge regarding the level of susceptibility of North American Fraxinus species is limited. Based on observations from Estonian parks, F. nigra seems to be highly susceptible to shoot infection, while F. americana and F. pennsylvanica are more tolerant (Drenkhan and Hanso 2010). Inoculation studies have further shown that F. pennsylvanica develops minor lesions after stem inoculation with H. fraxineus (Gross and Sieber 2016; Kowalski et al. 2015). North American Fraxinus species are already severely threatened by the introduced emerald ash borer (Kovacs et al. 2010). Should North American species of Fraxinus be equally susceptible to H. fraxineus as European F. excelsior, introduction of the pathogen to North America would add significant pressure on local Fraxinus species in natural ecosystems and urban areas. The aims of the current study were to: (1) investigate whether Asian species other than F. mandshurica and F. chinensis could function as hosts for H. fraxineus, (2) test the susceptibility of North American Fraxinus species to the fungus and (3) relate the variation in susceptibility to species phylogeny. Specifically, we assessed the occurrence of disease symptoms and the ability to support pathogen fructification on Asian, North American and European ashes growing in a common site in Europe (Hørsholm, Denmark) infested by the pathogen. We also determined the relative response of these species to direct shoot and leaf inoculation, quantified the amount of H. fraxineus DNA in leaves and associated it with symptom development. Based on the observed performance of North American ash species in Europe, we discuss the potential consequences of pathogen introduction to North America. All experimental plant material is based on a collection of Fraxinus species growing in the Arboretum in Hørsholm (N55° 52.193 E012° 30.145) in Denmark. Confirmation of species identity was based on leaves, leaf scars, flowers and mature trees, and on DNA sequence data of the ITS region (ITS4 and ITS5; China Plant et al. 2011) of nrDNA. The following PCR conditions were used: 5 min at 94 °C, 35 cycles of 94 °C for 1 min, 53 °C for 1 min and 72 °C for 1 min, followed by 72 °C for 7 min. PCR products were purified and sequenced by Macrogen Inc. (Seoul, Korea). Species identification (incl. ITS) was carried out for all trees used for inoculation and for monitoring fruit body formation (with few exceptions, see Supporting Information S1 Table). For the health survey carried out in the arboretum, additional trees of each species were surveyed if available. The following taxa were used in the study: F. excelsior, F. angustifolia (subsp. angustifolia and subsp. syriaca), F. mandshurica, F. nigra, F. chinensis (subsp. chinensis and subsp. rhynchophylla), F. lanuginosa, F. sieboldiana, F. ornus, F. paxiana, F. platypoda, F. quadrangulata, F. albicans, F. americana, F. latifolia, F. pennsylvanica, F. profunda, F. velutina (Table 1). More detailed information of the material is enclosed in supporting Information S1 Table. Mature trees in the arboretum were carefully inspected for any disease symptoms during 8–13 August 2013, the middle of local growing season. The assessment covered in total 105 trees [including all trees that had been vegetatively propagated for inoculation studies (cf. below)]. A general health status (GH) was given on a scale from 0 to 9 and evaluated based on the presence of dead branches and lesions, epicormic shoots and cankers (0: dead trees, 1–3: severely damaged trees, 4–6: trees with intermediate health and 7–9: healthy trees). Three ash dieback-related characters were scored: Ash dieback crown damage (Percent Damage Score = PDS) was scored on a 5-step scale (McKinney et al. 2011); 0%: no signs of infection, 5% (<10% crown damage), 30% (10–50% crown damage), 75% (>50% of crown damage) and 100% (dead). The presence of Epicormic shoots (EPIC) was scored at three levels: 0 = no epicormic shoots, 1 = healthy epicormic shoots present and 2 = symptomatic epicormic shoots present. Necrosis development (NEC) assigned to ash dieback was classified into four levels: 0 = no necroses, 1 = few necroses, 2 = several necroses and 3 = many necroses. GH and PDS were analyzed as quantitative traits by using a generalized linear ANOVA model, where residual variation (ε) was assumed to be normally distributed with variance independent of the tested effects. We tested variation among species against variation among trees within species (GH/PDS = S species + ε) and variation among origins against variation among species within origins (GH/PDS = O origin + S species (O origin) + ε), where origin was either North America, Europe or Asia. Finally, we tested variation among sections against variation among species within sections (GH/PDS = S section + S species(S section) + ε) where species assignment to section follows Wallander (2012). The tested sections were Ornus, Fraxinus and Melioides, whereas section Dipetalae was excluded as only one tree of a single species was available. The test for variation among sections was carried out both with and without F. mandschurica based on the hypothesis that this species deviates from the remaining species of the Fraxinus section due to co-evolutionary adaptation to the fungus. Two of the studied species, F. nigra and F. quadrangulata, had very poor general health and high damage level (PDS) on the observed trees. F tests were therefore also made both with and without these species in order to infer on their importance for the overall results. Assumptions of independent and normal-distributed residuals with variance homogeneity were considered by visual inspection of residual plots. Both traits required transformation in order to meet the ANOVA assumptions: General health GH score was squared before ANOVA [Y = (GH)2], while the damage score was log-transformed [Y = log (PDS + 1)]. The two other symptom measures, EPIC and NEC, represented categorical data with few observations per class. Here, trees were pooled according to their origin, independent of species, and tested for homogeneity among origins (and sections) by Fisher’s exact test. To identify Fraxinus species that support completion of the life cycle of H. fraxineus, we collected leaves from the crowns of trees growing in the arboretum (from the same tree clones used for vegetative propagation). Leaves from two to three branches from different canopy positions were collected at two time points (24 August and 20 September 2011) and placed in ID-labeled potato sacks made of nylon. All sacks were fixed to the ground with tent poles in eight random groups underneath a large F. excelsior specimen and left undisturbed for a year. Apothecium development was inspected twice, between 30 July and 2 August 2012 and between 27 August and 28 August 2012 using the following classes (per sack): 0 = no apothecia; few = 1–3 apothecia; several = 4–10 apothecia; many = >10 apothecia present. A CAPS marker previously designed for easy identification of fruiting bodies from H. fraxineus (McKinney et al. 2012a) was used as a fast and cost-efficient species verification tool on developed fruiting bodies. DNA was extracted from at least one apothecium per ash species with a DNeasy Plant mini Kit (Qiagen, Hilden Germany) following the manufacturer’s protocol except for excluding the shredder column. PCRs were performed as described in an earlier study (Johansson et al. 2010) and run on a Biorad thermo cycler (model c1000). PCR products from H. fraxineus were identified following McKinney et al. (2012a). Scions were collected from two individual trees per species on 07 March 2011 (or one if only one specimen was present for the species). The scions were grafted onto F. excelsior root stocks and kept in a greenhouse that followed the outdoor conditions except from being frost free. Susceptibility was tested with a single-spore culture of H. fraxineus isolated from an apothecium collected underneath symptomatic F. excelsior trees in a park (Vigerslevparken, N55°38.690 E12°29.780) outside Copenhagen. Two weeks prior to inoculation, sterile ash wood plugs (around 160 (4 × 4 × 10) mm3 in size) were added to the fungal culture grown on malt extract agar. On 14 December 2012, 1 to 8 ramets per species (in total 84 ramets) were inoculated with the mycelia-colonized ash plugs following a method earlier described (McKinney et al. 2012b). As controls, the same ramet was similarly inoculated with sterile ash plugs. The ramets were inspected for stem lesions after an incubation period of 6 months, and the lengths of stem bark lesions were measured. The lesion lengths downward from the inoculation point were used in the statistical analysis, and only clones with at least two tested ramets were considered. The data was analyzed by a generalized linear ANOVA model. We first calculated the average lesion length across ramets for each clone (grafted mature tree) and then tested the variation among species against the variation among clones within species and the variation among origins/sections against variation among species within origins/sections using a model similar to the analysis of GH and PDS of the mature trees described above. Necrotic tissue from a sub-set (13 samples) of the stem inoculated grafts was collected 18 months after inoculation, and the amount of H. fraxineus DNA was determined with a real-time PCR assay specific to the fungus (see below). In the laboratory, the outer bark was scraped off the inoculated stem samples and 20–40 mg of tissue was sampled around the border between symptomatic and non-symptomatic tissues. DNA was extracted using a DNeasy Plant mini Kit (Qiagen, Hilden Germany) according to manufacturer’s instructions and eluting the extract in 100 µl elution buffer. A tenfold dilution series was prepared for each DNA sample, and two replicates of each of the three dilutions (undiluted, 10-fold and 100-fold) were used as template in the real-time PCR. Real-time PCRs were performed on an Mx3005p system (Agilent Technologies, California, USA) with qPCR core kit no ROX (Eurogentec, Seraing, Belgium) by using the primer/probe set described by Ioos et al. (2009). The thermal profile consisted of 10 min at 95 °C, followed by 45 cycles of 95 °C for 15 s and 65 °C for 55 s. The Ct value was recorded using the MxPro QPCR software (Agilent Technologies, California, USA). The DNA amount standard curve for H. fraxineus, generated from a six-log dilution series of pure pathogen DNA and based on the relationship of known DNA concentrations (y) and corresponding average Ct value (x) from four PCRs replicated per DNA concentration, was y = −0.2742x + 8.8258 (R 2 = 0.998). This equation was used to calculate H. fraxineus DNA amount in experimental samples. The average of the two 10× dilutions of the template is reported to avoid the effects of PCR inhibitors in the undiluted sample. A spore-exposure experiment similar to Cleary et al. (2013b) was set up to detect whether leaf infection can be established by ascospores of H. fraxineus in North American, European and Asian ash species and to observe for symptoms. One graft from two or three clones of each Fraxinus species (15 species) was placed in a closed, heated (20–30 °C) chamber in April 2014. A Rhododendron specimen was included as negative control. Two months ahead, ash leaf rachises had been collected from an ash field trial “Scion” (N55°52.044 E12°29.210) and kept humid at room temperature. In April, when apothecia started to form, the rachises were arranged on top of the soil in the pots of the grafts. The pots were watered daily, and an air-fan was used to ensure air turbulence in the chamber. Parallel to the inoculation chamber, grafts of the same clones were arranged in a control chamber without H. fraxineus apothecia. Leaf material was harvested weekly from 19 May to 13 August 2014 from plants in the inoculation chamber. Observations of lesions were registered every week for the first 6 weeks and every second week thereafter. In addition, at each time point one leaflet was collected from 20 of the plants and used to quantify the accumulation of spores on the leaf surface throughout the sampling period by using a trypan blue staining procedure (Koch and Slusarenko 1990). The leaves were mounted in 70% glycerol for microscopy. The number of spores that were morphologically similar to ascospores of H. fraxineus (Kowalski and Holdenrieder 2009) was counted at four random locations per leaflet by using a grid of 1 mm2 and reported as the average of the four counts. From all living plants in the spore chamber (28 plants), one leaflet per sampling time point was subjected to a surface sterilization procedure (Zimmerman and Vitousek 2012) to remove propagules present on the leaf surfaces. Twenty milligrams frozen leaf material per specimen was used for DNA extractions. DNA was extracted according to manufacturer’s instructions using the 96 E.Z.N.A. kit (Omega Bio-Tek, Georgia, USA) and followed by qPCR as described above. The general health (GH) of the surveyed species in the arboretum (influenced by diseases, shade of other trees, different environment compared to place of origin, etc.) was in most cases intermediate with exception of F. nigra and F. quandrangulata, which were in very poor condition (Fig. 1). The variation in health condition was significant among species (F = 1.80; p = 0.043; Table 2) but not among the three geographic regions nor among sections. PDS (crown damage) varied among species and origins (Table 2; Fig. 2). The differences among species and among origins remained significant when analyzed without F. nigra and F. quandrangulata (data not shown). Regarding comparison of sections, significant differences were observed only when leaving out F. mandshurica in the comparison (Table 2). Of the seven Asian taxa F. lanuginosa, F. platypoda and F. sieboldiana showed no signs of crown damage in any of the nine assessed trees, while the remaining four species showed only minor crown damage (0 or 0–10% except for one tree of F. paxiana with 10–50% damage). One tree out of the 13 assessed trees from the Asian representative of the Fraxinus section, F. mandshurica, showed some (<10%) ash dieback symptoms in the crown. Among the European taxa, F. ornus was the healthiest with only one out of seven assessed trees showing minor (<10%) crown damage. Of the assessed F. excelsior trees (section Fraxinus), two showed no crown damage, while one showed up to 10%, one 10–50% and one 50–75% crown damage. Out of ten F. angustifolia trees (section Fraxinus), two showed no crown symptoms, five showed <10% damage, two trees scored 10–50% damage, and one was heavily damaged (50–75% crown damage). All North American species included trees with crown symptoms. All trees of F. nigra (section Fraxinus) and the single specimen of F. quadrangulata (section Dipetalae) were severely affected. The remaining North American species all belonged to section Melioides. Many trees of F. pennsylvanica and F. americana had crown symptoms (six out of eleven F. pennsylvanica had up to 10% crown damage, and six out of ten F. americana had up to 10% crown damage with one F. americana presumably killed because of the disease). Also F. albicans and F. latifolia had clear crown symptoms. Fraxinus velutina was the healthiest North American Fraxinus species in the arboretum with only one out of five trees showing minor crown damage (<10%). One of the two other ash dieback-related characters (NEC) also varied significantly among origins with the highest level among North American species. The amount of epicormic shoots was on average also highest in North American species, although not significant (Table 2). Apothecia were found on tissues of the compound leaves from all species except for F. paxiana and F. sieboldiana (Table 3)—the test with the CAPS marker confirmed that the apothecia represented H. fraxineus. The highest frequencies of apothecia were found on leaf tissues of F. mandshurica, F.excelsior, F. angustifolia subsp. syrica, F. nigra (all section Fraxinus) and F. quadrangulata (section Dipetalae). Apart from F. mandshurica, all these species also showed relatively high levels of crown damage in the arboretum (Fig. 3). Apothecia were also frequently found on F. albicans, F. angustifolia and F. latifolia and in some bags of F. ornus, F. platypoda, F. profunda, F. pennsylvanica and F. velutina. Very few apothecia were observed on leaves of F. americana, F. chinensis subsp. rhychophylla and F. lanuginosa (Table 3). The tested species responded to a varying degree to direct stem inoculation with mycelial wood plugs, while the controls inoculated with sterile wood plugs showed no infection (no discoloration around the inoculation wound). The size of the lesions varied significantly among species, origins and also sections when F. mandshurica was excluded from the analysis (Table 2). Three Asian taxa did not develop symptomatic lesions (F. chinensis subsp. rhynchophylla, F. lanuginosa and F. platypoda; Figs. 3, 4), while two out of eight F. mandshurica grafts developed minor lesions (downward spread of 2 and 3 cm, respectively). Fraxinus sieboldiana developed lesions that on average were >5 cm long (Figs. 3, 4). Among the European ash species, species belonging to the clade Fraxinus, F. excelsior and F. angustifolia subsp. syriaca, developed the largest lesions (Fig. 3) (no living grafts of F. angustifolia subsp. angustifolia were available for inoculations), while F. ornus showed shorter lesions (range 0–2.5 cm). All American ashes developed lesions. The ranges for F. latifolia and F. velutina were 5–13 cm and 7.5–11, respectively. Fraxinus americana and F. pennsylvanica developed shorter lesions (ranges 1.5–5.3 and 1.5–8 cm, respectively). The single F. nigra graft tested developed a clear lesion and died shortly after due to stem girdling and was therefore not included in the quantitative analysis. DNA of H. fraxineus was detected in 9 out of 13 tested samples collected 18 months after inoculation (Supporting Information S2 Table). Grafts from the control chamber showed no symptoms. In the experimental chamber where plants were exposed to pathogen sporulation, the maximum number of spores was detected on leaves in the period between 24 June and 15 July 2014 (S1 Fig). By July 29 many of the plants had shed their leaves and the experiment was therefore terminated. Even though the leaves were surface-sterilized as described above a low level of pathogen DNA ranging from 0.18 to 0.56 pg DNA/µl DNA extract was detected in the “Rhododendron sp.”—sample used as non-host reference (S3 Table). An amount of pathogen DNA below 0.5 pg DNA/µl DNA was therefore considered as non-specific background level. The highest amount of pathogen DNA was detected in the Fraxinus clade (Fig. 5). Leaf samples of the Asian representative from the Fraxinus clade (F. mandshurica) showed symptoms similar to those known from F. excelsior (large brown lesions, often with undulating edges that were restricted to leaflet midribs and veins and neighboring lamina regions, sometimes also occurring on leaf petioles). The leaf samples of F. mandshurica also exhibited relatively high levels of pathogen DNA (ID 1995-0717-1, 32 pg DNA/µl DNA extract on July 15, S3 Table). Regarding the remaining Asian species (all from the Ornus section), F. lanuginosa showed no clear symptoms despite the high level of H. fraxineus DNA detected in the leaves (Fig. 5). Most of the remaining Asian species (F. chinensis, F. paxiana and F. sieboldiana) showed necrotic, sunken lesions of variable size that were often localized in lamina region areas between leaflet veins, and sharply delimited from the neighboring healthy tissues. Fraxinus platypoda shed its leaves early and before any symptoms were observed. The low levels of H. fraxineus DNA in the leaves of these four species were comparable to those observed in the non-host reference. The European members of the Fraxinus clade, F. excelsior and F. angustifolia showed necrotic leaf lesions and high levels of H. fraxineus DNA similar to F. mandshurica (Fig. 5). One specimen of F. ornus (ID 1970-0476-1) also had a relatively high level of H. fraxineus DNA in the leaves (S3 Table). Brown sunken lesions similar to some of the Asian species were also observed on F. ornus leaflets. Among North American Fraxinus species, F. latifolia (ID 1985-0735-3) had an especially high content of H. fraxineus DNA and showed brown lesions on leaf petioles. Also one specimen of F. americana (ID 1950-0213-1) had high levels of pathogen DNA at the end of the experiment (21 pg). The level was also relatively high in F. velutina (Fig. 5). Fraxinus pennsylvanica had 7 pg pathogen DNA/µl DNA extract on July 15, while the amount in F. albicans was comparable to that observed in the non-host reference. Hymenoscyphus fraxineus DNA was not detected in F. quadrangulata despite clear symptoms that appeared on June 24 shortly before the graft died. Also F. albicans, F. americana and F. pennsylvanica showed symptoms similar to those caused by H. fraxineus on F. excelsior (Fig. 5). Buildup of high infection pressure is a pre-requisite for introduced fungi to become invasive in a new environment. Currently, shoot infection of European ash is believed to result from pathogen hyphae growing into the stem via the leaf petiole before leaf shed (Gross et al. 2012; Landolt et al. 2016). Since the fruit bodies of H. fraxineus are abundantly formed on leaf veins and rarely on shoot tissues, leaf colonization is key factor to the invasiveness of this fungus, whereas colonization of shoot by the pathogen, even if a useful trait to score host susceptibility, can be considered a dead end in the life cycle of H. fraxineus. In our study we found that H. fraxineus could colonize leaves and develop apothecia in most Fraxinus species originating from three different continents, although at variable levels. These results highlight the ability of the fungus to shift host and perhaps become invasive in new areas. There were some inconsistencies between crown damage of some species in the arboretum and their performance in greenhouse conditions. It is important to note that most likely not all the shoot symptoms observed in the field, even if seemingly similar to those caused by H. fraxineus, are directly related to this pathogen and that field conditions may differ from those of the employed greenhouse conditions also when it comes to pathogen inoculum size and infection route. The current model of H. fraxineus life cycle suggests that ash stem infections are caused by fungal mycelium which originates from ascospores germinating on leaf surfaces. Following infection of leaf tissues, the mycelium spreads through the petiole into shoots, twigs and causes characteristic bark lesions and crown dieback (Gross et al. 2014a). Direct stem inoculations routinely involve the placement of a relatively large mycelial inoculum onto a stem wound; positive results (i.e., formation of a lesion) from such treatments may represent an artifact as the treatment circumvents host defense responses induced following leaf infection and also the structural defense mechanisms present in bark. To interpret the current data, a combined assessment of (1) tree field performance, (2) ability to support pathogen sporulation and (3) formation of symptoms in controlled inoculation experiments is pursued below. Field observations from Japan and China have suggested that H. fraxineus is a harmless associate of native Manchurian ash (F. mandshurica) (Zhao et al. 2013; Zheng and Zhuang 2014). A recent study confirmed the presence of H. fraxineus in asymptomatic leaves of F. mandshurica from Eastern Russia (Cleary et al. 2016). 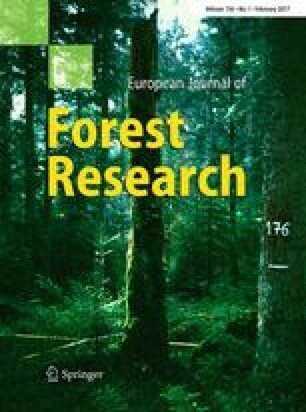 In another recent study, significantly higher levels of H. fraxineus DNA were detected in necrotic leaf veins compared to asymptomatic leaves of F. mandshurica from Russia Far East suggesting that the leaf symptoms were indeed caused by the pathogen (Drenkhan et al. 2016). In contrast, the low DNA levels of H. fraxineus recorded in symptomatic shoot tissues of F. mandshurica in Russia Far East suggest that the fungus is not a shoot pathogen on this tree. Our results concerning F. mandshurica are in agreement with Drenkhan et al. (2016). When grafts of the different species were exposed to high infection pressure by H. fraxineus ascospores in a moist spore chamber, leaves of F. mandshurica exhibited high densities of pathogen DNA and developed brown lesions in leaflet midribs and veins and leaf petioles, symptoms characteristic of leaf infection on European ash (Cleary et al. 2013b). In the arboretum F. mandshurica showed good performance with visible shoot symptoms in only one out of 13 assessed trees despite a high local infection pressure that resulted in significant production of H. fraxineus ascomata on its overwintered leaf tissues. When subjected to direct stem inoculations, F. mandshurica developed no or only very short lesions. Another study with F. mandshurica has also reported lesion development after direct stem inoculations (Gross and Holdenrieder 2015). Collectively, the previous study and our data indicate that when the infection pressure is high, H. fraxineus is able to establish a necrotrophic feeding mode in the leaves of F. mandshurica. The low level of shoot symptoms in arboretum grown F. mandshurica together with the previous observations of low levels of H. fraxineus DNA in necrotic bark lesions in F. mandshurica from Far East Russia (Drenkhan et al. 2016) indicates that the tree species is fairly resistant to shoot infection by H. fraxineus and that H. fraxineus is a facultative leaf pathogen of F. mandshurica. Both in Korea (Han et al. 2014) and in Russia Far East (Drenkhan et al. 2016) apothecia of H. fraxineus have been recorded on fallen leaves of F. chinensis subsp. rhyncophylla, indicating that some additional ash species can serve as hosts for H. fraxineus in Asia. As in Korea no (or very limited) symptoms of ash dieback were observed in F. chinensis subsp. rhyncophylla trees in the arboretum, where pathogen apothecia developed on leaf rachises but at a much lower frequency than on F. mandshurica leaves. In addition, we did not detect H. fraxineus DNA in the leaves of F. chinensis subsp. rhyncophylla after intensive spore exposure and no lesions were developed after direct stem inoculation of the species. These observations suggest that F. chinensis subsp. rhynchophylla may be less susceptible to leaf infection by H. fraxineus than F. mandshurica. When exposed to the natural infection in the arboretum, some of the additional Asian Fraxinus species considered were also asymptomatic or showed only a few dead shoots. In contrast to F. mandshurica, these species showed low or no production of pathogen ascomata in the overwintered leaves and no or limited accumulation of pathogen DNA in leaves of grafts exposed to H. fraxineus spores. The apparent failure of H. fraxineus to infect some of these species (F. sieboldiana and perhaps also F. paxiana) may reflect cases of non-host resistance (Antonovics et al. 2013). Detailed studies on the infection process and the tree responses are needed to unravel the mechanisms behind the apparent resistance in Asian species that do not belong to section Fraxinus. Three out of the four ash species mostly affected by shoot dieback in the arboretum were the European F. excelsior and F. angustifolia s.l., and the North American F. nigra (see Fig. 3). One of the F. angustifolia subspecies, F. angustifolia subsp. syriaca, which is a synonym to F. sogdiana (Wallander 2012), has an East European distribution stretching from Turkey into Western Asia. All three species belong to section Fraxinus that also includes F. mandshurica (Wallander 2012). In contrast, the European F. ornus, the only species from section Ornus distributed outside Asia, was one of the healthiest ash species in the arboretum. Consistent section-specific patterns were also observed in the other parts of our study. The amount of pathogen ascomata formed on leaf tissues was high in all species of section Fraxinus and relatively low in Ornus (see Fig. 5). Like F. mandshurica, in the spore inoculation test F. excelsior and F. angustifolia developed early lesions on leaflet midribs, veins and leaf petioles, whereas relatively large continuous lesions could be observed on F. ornus similar to what was found in several Asian species belonging to Ornus. Formation of necrotic lesions on leaflet midribs and veins and leaf petioles was a feature common to all the species that supported high production of pathogen ascomata in the arboretum, and is consistent with the view that early colonization of the vascular cylinder of the compound leaf by H. fraxineus is a prerequisite for securing this sporulation niche. Considerably longer lesions were formed in F. angustifolia (subsp. syriaca) and F. excelsior after direct stem inoculation than in F. ornus. While Fraxinus nigra was not included in the spore inoculation test, in the stem inoculation experiment the single ramet (graft) of this species died soon after inoculation due to stem girdling. These data are consistent with field and park observations, which indicate that F. excelsior (Kowalski 2006), F. angustifolia s.l. (Drenkhan et al. 2015; Kirisits et al. 2010) and F. nigra (Drenkhan and Hanso 2010) are more susceptible to ash dieback than F. ornus (Kirisits and Schwanda 2015). The North American specimen of F. quadrangulata (section Dipetalae) was the fourth species highly affected by ash dieback in the arboretum and consistently also supported a high production of pathogen apothecia. Incidentally in a previous classification of Fraxinus based on floral characteristics, F. mandshurica, F. excelsior, F. angustifolia, F. nigra and F. quadrangulata were considered as close relatives (Nikolaev 1981). Fraxinus quadrangulata was not included in the stem inoculation test, but in the spore inoculation test it showed distinct leaf lesions (Fig. 5) and died very quickly. Overall this species seemed to be equally susceptible to H. fraxineus as the species in the section Fraxinus. Collectively, our data may suggest that there is an ancient phylogenetic signal in terms of pathogen host range, as all members of the Fraxinus section from three different continents were suitable hosts for H. fraxineus. This pattern is in line with the findings of Gilbert and co-workers (Gilbert and Webb 2007; Gilbert et al. 2015), who showed that the likelihood that a pathogen can infect two plant species and the impact of infection decrease with phylogenetic distance between the species. The difference in shoot susceptibility between F. mandshurica and other members of section Fraxinus could suggest that the former has developed pathogen tolerance after the diversification of the section. The low disease susceptibility of species in section Ornus may be due to the development of resistance due to sympatric existence with H. fraxineus (given that their geographic distributions overlap). Recent identifications of new species of Hymenoscyphus related to Asian ashes suggest a diversification of Hymenscyphus species on Fraxinus (Gross and Han 2015; Gross et al. 2015), thus supporting our interpretation of co-evolutionary relationships. Section Melioides that includes most of the North American Fraxinus species showed low (F. velutina) to medium (F. latifolia) levels of shoot dieback when exposed to natural infection in the arboretum (See Fig. 2). All tested species except F. profunda developed relatively long lesions in the direct stem inoculation experiment (short in F. profunda), supported pathogen sporulation and showed generally high levels of pathogen DNA in leaf tissues. Other studies have similarly reported moderate susceptibility to ash dieback in species from section Melioides (Drenkhan and Hanso 2010; Gross and Sieber 2016; Kowalski et al. 2015). The moderate disease susceptibility of North American ash species provides further support for the presence of an ancient phylogenetic signal in terms of pathogen host range. The molecular background of genetic variation in differential field performance of F. excelsior trees is largely unknown. Recently a set of genetic markers that is closely associated to variation in susceptibility among genotypes of F. excelsior has been identified (Harper et al. 2016). A cDNA-based SNP polymorphism was associated with susceptibility, where highly susceptible F. excelsior trees only showed allele A, while trees with reduced susceptibility also showed allele G. The species F. mandschurica, F. ornus and F. americana were genotyped as G/G, which fits well with the observations from the present study that these species exhibit high levels of tolerance. European ash shows evident genetic variation in the level of susceptibility to shoot damage caused by H. fraxineus (Kirisits and Freinschlag 2012; Lobo et al. 2014; McKinney et al. 2011; Stener 2013), a feature that is inherited from parents to offspring (Kjær et al. 2012; Lobo et al. 2015; Pliura et al. 2011). The genetic mechanisms behind the differential field performance of individual trees in stands with epidemic levels of disease remain unknown. It is not clear whether the less susceptible trees of European ash (F. excelsior) avoid the disease because of resistance to leaf infection as is likely in Asian species of section Ornus, or because of pathogen tolerance as in F. mandshurica, the native host and close relative of European ash. Higher pathogen tolerance in individuals of F. excelsior with a selectively advantageous genetic background could facilitate the maintenance of both a high pathogen population size and high virulence following a selective sweep. Comparative studies on the molecular interactions between H. fraxineus and Fraxinus species/individuals that display either high resistance to leaf infection or low susceptibility to shoot damage are warranted. The success of an exotic pathogen such as H. fraxineus when introduced to a new environment is likely to depend on several factors. Phylogenetic relatedness between the native and the new host plays a role, where the success of a host shift is more likely if the relatedness is high (Desprez-Loustau et al. 2016; Gilbert and Webb 2007). This could be due to a better “ecological match” between pathogen and new host (Desprez-Loustau et al. 2016), and because only few evolutionary changes are needed for the pathogen in order to adapt to the new host (Schulze-Lefert and Panstruga 2011). Other determining factors are the presence of pre-evolved defense mechanisms in the tree (Ennos 2015) and the ability of the new host to support the buildup of high infection pressure that is obviously crucial for the pathogenicity and invasiveness of H. fraxineus (Cross et al. 2016). Taking the long generation time of trees into consideration, adaptation of trees to newly introduced and quickly evolving pathogens is likely to rely on pre-existing genetic variation rather than the buildup of new mutations (Barrett and Schluter 2008). In the light of our results, what could happen if H. fraxineus was introduced to North America? Keeping in mind that a limited number of genotypes per ash species were included in the present study, our data would suggest that stands of F. nigra, the close relative to both Asian F. mandshurica and European F. excelsior, but also the more distant species F. quadrangulata, F. latifolia and F. albicans could support initial establishment of the pathogen and the formation of a high infection pressure. Fraxinus nigra and F. quadrangulata in particular may be so highly susceptible to both leaf and shoot infection by H. fraxineus that an epidemic level of ash dieback could arise. The remaining North American species examined may be less susceptible to shoot infection but are not resistant to leaf infection and could presumably contribute to buildup of infection pressure via supporting pathogen ascocarp formation. Moreover, Fraxinus has been widely planted in the USA (Kovacs et al. 2010). The genetic basis of the planted ash material is often small and in some cases as few as 4–5 cultivars (clones) have been used in urban ecosystems (MacFarlane and Meyer 2005). In Europe only 1–5% of the native ash population of F. excelsior has a reasonable level of resistance (or tolerance) to the pathogen (Lobo et al. 2014). It is still unknown if this is also the case for North American ashes. When facing a potential new pathogen, as broad a genetic base as possible should be deployed in the planted areas to improve the resilience of the plantings (Budde et al. 2016). Overall, our evidence suggests that an unintended introduction of H. fraxineus would cause additional pressure on North American Fraxinus species that are already under strong selective pressure due to the Emerald ash borer infestation in Eastern North America (Kovacs et al. 2010). While most of the native Fraxinus species are susceptible to the borer, F. quadrangulata is considered resistant (Tanis and McCullough 2012), but this species seemed to be highly susceptible to ash dieback in our study. Regarding potential pathways of introduction of H. fraxineus to North America arrival via airborne ascospores seems less plausible than introduction via import of infected but asymptomatic plants, seeds (Cleary et al. 2013a) or wood (Husson et al. 2012). Given the higher genetic variation (Cleary et al. 2016; Gross et al. 2014b) and presumably also higher virulence of East Asian strains (Gross and Sieber 2016), introductions from East Asia would be especially critical (Landolt et al. 2016). Our results highly support measures taken to prevent unintended introduction of H. fraxineus via ash products to North America, a scenario that would likely result in species decline in one of the two main centers of diversity of genus Fraxinus. Ole Byrgesen, Lene Hasmark Andersen, Ruth Bruus Jakobsen, Lars Nørgaard Hansen, Theodor Emil Bolsterli, Sofie F. Hansen and Viggo Jensen are all warmly thanked for their technical assistance in laboratory, field or greenhouse throughout the project. Eva Wallander’s taxonomic expertise is highly appreciated for the identification of the Fraxinus species. Laura Kelly and Clive Brasier are kindly thanked for valuable comments on earlier versions of the manuscript. We thank the Danish Council for Independent Research (Project No. 0602-02436B) and Godfred Birkedal Hartmanns Familiefond for economic support.